Eats: The April "Invisible" Baskin Robbins promotion. So yesterday, a mate of mine, Jason, dropped over for a visit (after I threw a rant.. his words, not mine..LOL )..
We ended up at Midvalley for Baskin Robbins as he wanted to have ice-cream... (for his belated birthday treat.. ), and he wanted to check out camera bags. This was the "Invisible" promotion at Baskin Robbins. One thing I must say, mixing Orange Sherbet with creamy Vanilla, and Chocolate flavours is a No-No. LOL. 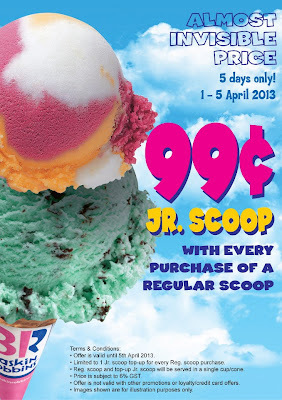 RM0.99 Jr. Scoop with every purchase of Regular Scoop. Hurry! Till 5th April 2013 only!